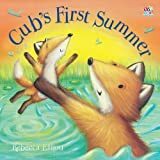 When the little cub wakes, mother fox suggests exploring the forest and off they go, with cub asking questions to satisfy his huge curiosity. Each page-turn shows a different scene, provoking new questions. ‘Why are the days so long?’ ‘So we have more time for fun,’ laughs Mum, as the sunlight begins to fade. As the day progresses, tension builds in both text and illustrations as the clouds get darker and the air heavier. At full speed mother and cub retrace their steps as the thunderstorm rages, the pages darkly glowing in the storm. ‘Why is the thunderstorm so scary?’ ‘So we can snuggle up tight,’ replies Mum, as they reach the safety and comfort of their home. The final page is full of colour and warmth, the foxes cuddled up and sleeping. A perfect book for bedtime.